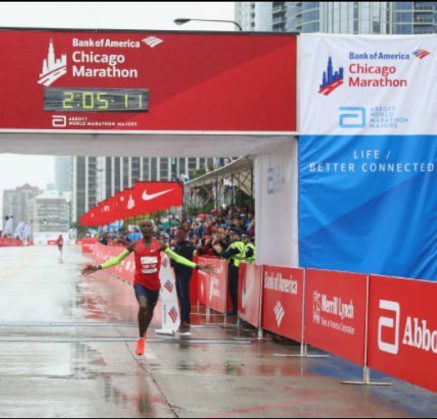 7th October 2018 – On a cold and wet day in Chicago, Sir Mo Farah (GBR) won his first major marathon and set a new European record in the process. Despite pace makers being back in the field after a few years absence, the opening 10k was quite sedate at 30:11 but beyond this point the field began to increase the speed and a large lead group which also included the defending champion Galen Rupp (USA) passed halfway in 63:02. With all the main protagonists to the fore there was a period where everyone seemed to be watching each other waiting to see who made a move first. Geoffrey Kirui made some surges which did split the field but Mo, Galen and Sugaru Osaku of Japan were able to work together to get back on terms. With 3 miles to run Mo hit the front for the first time and began to control and pick up the tempo. One by one runners fell off the group until entering the last 600m only Geremew of Ethiopia remained. Once more we witnessed the finishing speed that Mo possesses as he strode away up the final straight and was able to acknowledge the crowd as he crossed the line 2:05:11. Galen fought hard over the closing stages to take fifth position in his second fastest marathon time of 2:06:21. At the inaugural Commonwealth Half Marathon Championships in Cardiff, Timothy Toroitich (UGA) added another medal to his collection taking bronze in 61:16. Steph Twell (GBR) who was representing Scotland took 7th position in the women’s race in 72:32.